You decided to get back in the gym, and have done a good job of sticking to a consistent schedule. You are finally seeing results, which is enough to get you back in the gym day after day, but you are starting to have a hard time getting excited about your workouts like you used to. When you first started working out, you would head to the gym in excitement, ready to feel that adrenaline high and burn off some excess energy. Now that it has become your regular routine, however, it’s a lot harder to get in the mood to burn those calories. This is what is called “workout boredom,” and while you may feel frustrated with it now, it’s relatively easy to beat with a little effort. 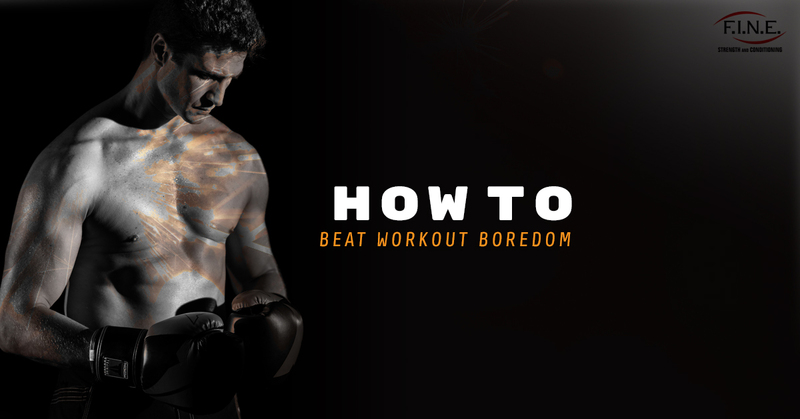 Read on for some tips for beating your workout boredom. When you first start working out, it can help to stick to the same exercises while you get used to a regular fitness routine. But if you have been spending an hour on the elliptical four times a week, it’s no wonder you’re feeling bored! You may also find that you are plateauing in your progress if you are doing the same thing over and over again. The solution to this problem is to switch up your workout routine! You might try switching to a different machine for your cardio, such as trying the stationary bike instead or try a workout class. If you don’t already incorporate strength training into your routine, try adding it into your workout. At Fit In New England, we would be more than happy to help you ensure you are using the proper form at the weight rack. A gym buddy is valuable for a lot of reasons, but one that you may benefit from right now is making your workout a little less dull. If working out alone is ho-hum, try adding a buddy into your routine to make it more interesting. Not only do gym buddies hold you accountable to your workout (you can’t skip your workout to go watch Game of Thrones if your buddy is at the gym waiting for you, after all), they will make it more entertaining because they give you someone to chat with, and may even help provide a little friendly competition. If you need to switch up your workout, consider working out with a friend. If you’re feeling bored, there’s a good chance you aren’t feeling challenged. While you may still be seeing progress now, over time, a boring workout sabotages your goals because it doesn’t push you to try harder. The same old boring workout routine holds you back because you don’t put in the same effort as you do with new workouts and ultimately, will cause you to give up. When you need to be challenged in your workouts, hiring a private personal trainer is a great solution. Your trainer will keep you invested in your workout and constantly striving to do better while regularly switching up your routine to keep you from getting bored or complacent. If you are looking for a way to beat workout boredom, consider coming into our gym in Medford. We have private personal trainers as well as group fitness classes to help you reach your goals. Contact us today to learn more!